David Gilman proves himself yet again to be an exceptional talent when it comes to historical novels. Meticulous research, fascinating period details, grab-you-by-the-throat action and wonderfully vivid descriptions of South Africa’s veldt that made me taste the dust between my teeth. He gives us all that in spades. But for me what raises Gilman’s books to a level above others is his ability to weave a powerful emotional story about a father’s desperate life-and-death search for his son into the fabric of a jaw-dropping tale of adventure, war and love. It moves at a compelling pace. The strong bond of the relationship between Joseph Radcliffe and his comrade in arms, Benjamin Pierce, drives the story of their search with a force that grips the reader and never lets go. The action takes place at the time of the Boer War and raises a number of moral questions that Gilman handles with sensitivity and skill, not least the role of women in this untamed land. (Gilman is always excellent at creating strong and intelligent female characters in his books.) 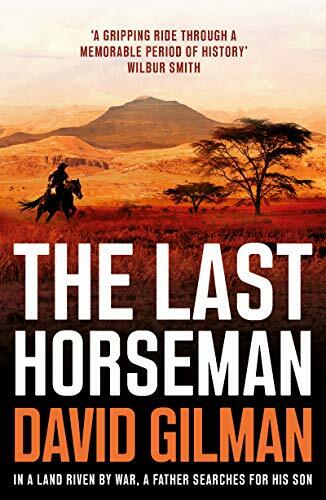 The Last Horseman is a wonderful read that kept me turning the pages late into the night. I highly recommend it.